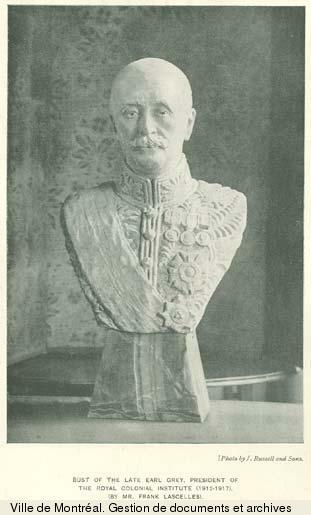 GREY, ALBERT HENRY GEORGE, 4th Earl GREY, governor general; b. 28 Nov. 1851 in London, England, son of Charles Grey and Caroline Eliza Farquhar; m. there 9 June 1877 Alice Holford, and they had three daughters and a son; d. 29 Aug. 1917 in Howick, England. The second son of the private secretary to Prince Albert and later Queen Victoria, Albert Grey was born and raised at the Court of St James. He was the epitome of the 19th-century English schoolboy: enthusiastic, idealistic, and studious. Educated at Harrow and Trinity College, Cambridge, he graduated from Cambridge in 1873. 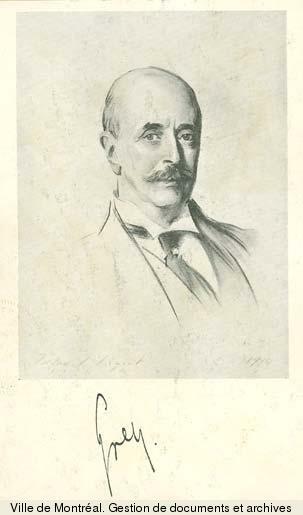 Brief service as secretary to Sir Henry Bartle Edward Frere, a member of the Indian Council, took him on a tour of India as part of the Prince of Wales’s entourage. He subsequently entered British politics as a Gladstonian Liberal. 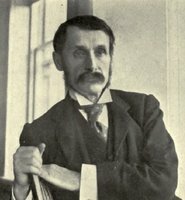 Defeated in 1878 in his bid to enter the House of Commons, he sat for South Northumberland in 1880–85 and Northumberland (Tyneside) in 1885–86. In the commons he headed a ginger group known as Grey’s Committee, a forum for novel political and social ideas. A tireless advocate of cooperation between consumers and producers, industrial profitsharing, technical education, proportional representation, church reform, temperance, and city beautification, he invested money in urban renewal projects and established the Public House Trust, a network of public houses that sold non-alcoholic beverages, with some profit going toward local improvements. In 1886 he split with William Ewart Gladstone over Home Rule for Ireland and became a Liberal Unionist. By this time, inspired by the theory of Italian nationalist Giuseppe Mazzini for world cooperation based upon patriotism and duty, Grey had become an ardent imperialist and a charter-member of the Imperial Federation League. 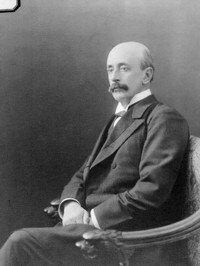 His acceptance of Cecil John Rhodes’s invitation to join the British South Africa Company brought him under the spell of this imperial expansionist. 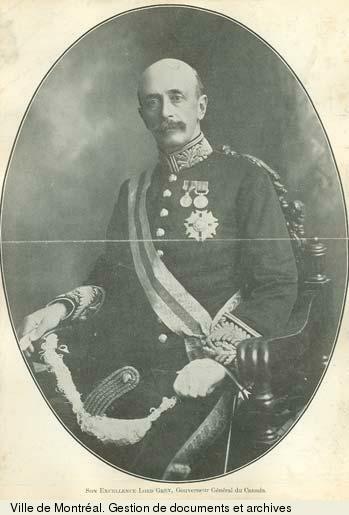 Grey was the link between Rhodes and Colonial Secretary Joseph Chamberlain before and during the notorious raid on the Transvaal in 1895 by Sir Leander Starr Jameson, whom Grey replaced as administrator of Rhodesia. Three years before his return to England in 1897, Grey (whose elder brother had died in 1855) had inherited his uncle’s earldom and estate in Northumberland, which he had been administering. In 1899 he became lord lieutenant of Northumberland. Meanwhile, his schemes for fostering physical and moral health throughout the British empire, such as the cadet movement, rifle shooting, the Rhodes Scholarship Trust (of which he became a trustee), and an imperial immigration plan, remained unabated. In August 1904 the government of Arthur James Balfour named Grey governor general of Canada, to succeed his brother-in-law the Earl of Minto [Elliot]; formal appointment followed on 26 September. 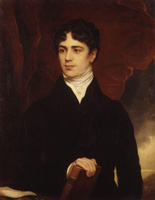 His family had connections to Canada: a daughter of the first earl had married fur-trade magnate Edward Ellice*; as an under-secretary in the Colonial Office, Grey’s uncle had formulated North American policy; and his father had been a member of the Special Council of Lord Durham [Lambton*] in Lower Canada in 1838. Although unwise investments in South Africa had left Grey penurious, his appointment was made possible by the generosity of his wife’s aunt Baroness Wantage, who would supplement his vice-regal salary. Grey’s crusading temperament and volubility, however, created some reservations in the mind of his seasoned brother-in-law in Canada. “I doubt Alberts level-headedness,” Minto confided to his wife, “& an enormous amount of harm may be done here by any impetuous action & want of judgement.” These qualities were to be mitigated by the experience and patience of the Canadian prime minister, Sir Wilfrid Laurier. 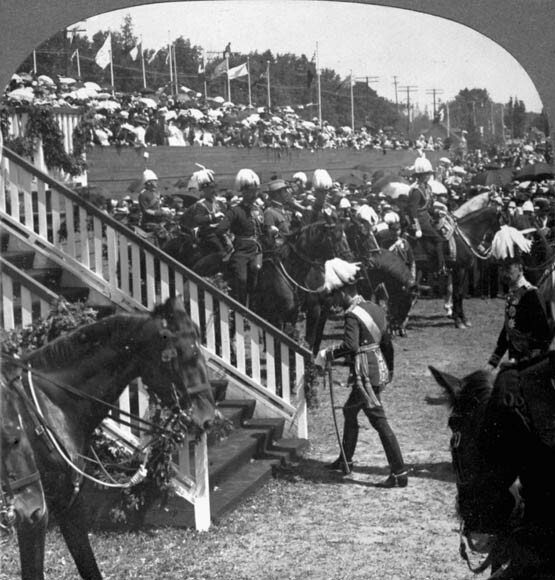 Immediately upon his arrival and swearing in at Halifax on 10 Dec. 1904, Grey initiated his imperial crusade, convinced that Canada was the key to the empire. Although the reputed goal of his imperialism was the establishment of a Mazzini-inspired peaceful world order, Grey’s vision did not exclude the use of force to achieve that end. 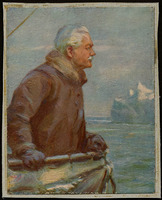 A naval enthusiast and promoter of the Navy League, he encouraged Laurier to establish a navy. Laurier would take his time setting up a naval force, however, and when he did, it was for his own reasons. 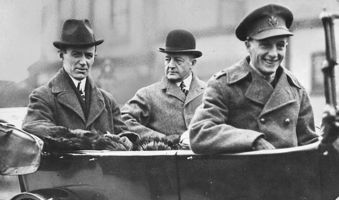 Grey also attempted, but failed, to persuade his prime minister to support one of Chamberlain’s pet projects, a permanent imperial council that could coordinate intercolonial defence, diplomacy, and tariff policy. With somewhat more success, Grey, at the urging of the Colonial Office, pushed Laurier to assume control of the remaining British garrisons at Halifax and Esquimalt, B.C., but this was a step that the minister of militia and defence, Sir Frederick William Borden, had already agreed to at the meeting of the Committee of Imperial Defence in December 1903. 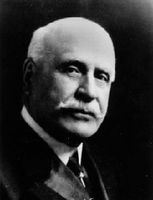 Despite his advocacy of Canadian autonomy, Grey’s commitment to the creation of a Canadian navy was so public and heavy-handed that the Naval Service Act of 1910 was known derisively as Grey’s Bill in Quebec, where it was opposed by Henri Bourassa*’s Nationalistes and Conservatives led by Frederick Debartzch Monk. For all his talk of a new world order, Grey’s imperialism was exclusive. Initially he championed the immigration of Asians to Canada. 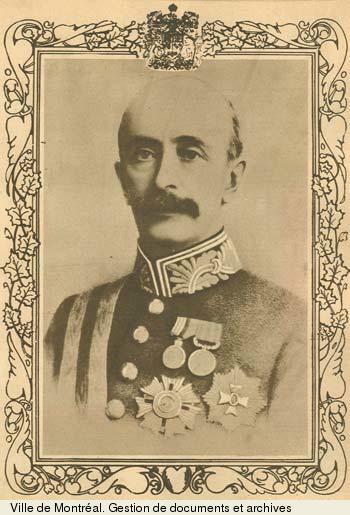 On one occasion he refused to visit British Columbia to protest the exclusionary legislation passed by the government of Richard McBride and he went to great pains to arrange the tour of Prince Fushimi of Japan in 1907. He did so for trade and diplomatic reasons, and because he believed that Japanese and Indian immigrants could become needed servants and labourers. But in the wake of the Russo-Japanese War, he became excessively concerned about the “yellow peril” and, with a view to restricting Asian immigration, collaborated with government officials to find diplomatically acceptable alternatives to the head tax. Grey displayed little more understanding in his dealings with French Canadians. He spoke French, promoted historical monuments in Quebec, continued Minto’s attempts to bring together English- and French-speaking élites, and was prepared to employ social sanctions against individuals, among them Toronto editor John Stephen Willison*, with intolerant views. 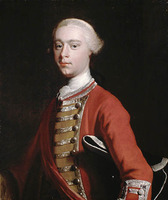 None the less, Grey’s belief in the primacy of English, and in the inevitability and benevolence of the conquest, blinded him to French Canadian opinion. His incomprehension became painfully clear during his preparations to celebrate the tercentenary of Quebec City in 1908. These plans grew out of his campaign, begun the previous year, to purchase the Plains of Abraham and turn them into a national park under a battlefield commission. His endeavours to elevate the project into a grand imperial enterprise fell short but nevertheless made it difficult to sell in Quebec. In the end Laurier was persuaded only by the intervention of Quebec mayor Georges Garneau* to pass the potentially controversial legislation in March 1908 creating the National Battlefields Commission. 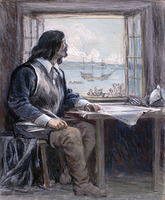 During this campaign Grey had discovered a citizens’ committee making modest plans to mark the tercentenary of Samuel de Champlain*’s founding of Quebec. Fresh from his battlefield victory, he decided to transform the event into an international celebration of Franco-Anglo-American friendship. The visit of the Prince of Wales, the Atlantic fleet, American and French warships, and a host of official representatives required coordination, diplomatically, by the governor general’s office and took arrangements well out of the hands of the local committee. In addition, the elaborate historical pageants promoted by Grey and staged in July threatened, despite their interpretative accommodations, to turn the event into a celebration of the arrival of British general James Wolfe* in 1759 rather than Champlain. The criticism voiced by Bourassa, mla Armand La Vergne*, and others was understandable, but not to Grey, who blamed the reaction on an unenlightened element in the Catholic church. 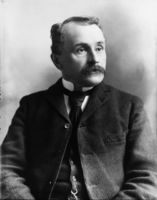 An example of Grey’s more successful forays into international diplomacy was his efforts to clear up Canadian-American difficulties that had followed the Alaska boundary settlement of 1903, which Canada had refused to accept. In conjunction with the British ambassador in Washington, first Sir Henry Mortimer Durand and then James Bryce, Grey worked assiduously to streamline the diplomatic process and break down misunderstanding through social diplomacy. He visited the United States and its leaders, and entertained them in Quebec and Ottawa. As a result, agreements were signed on boundary questions, the North Atlantic fisheries dispute, the regulation of sealing in the North Pacific and of inland fisheries in common waters, and other outstanding irritants. 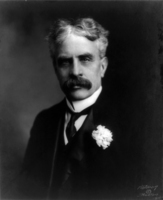 The most significant achievement, after years of negotiation, was the International Boundary Waters Treaty of 1909, which created the International Joint Commission, a mechanism for resolving disputes with a permanent membership and rules of procedure [see Sir George Christie Gibbons]. 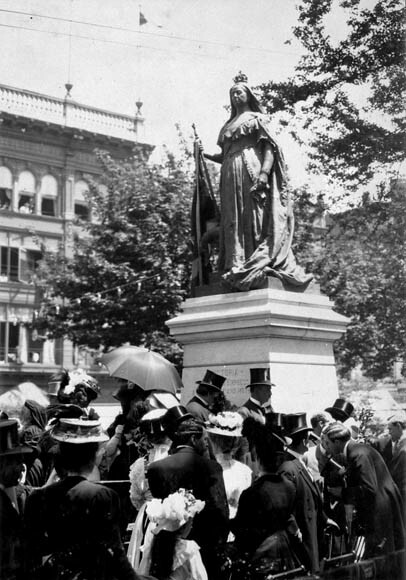 After much prodding from Grey and Bryce, Laurier accepted the treaty in 1910. In 1908–9 they had also prevailed upon the prime minister to create the Department of External Affairs. Less successful were Grey’s bizarre manoeuvres from 1906 to force Newfoundland into confederation. 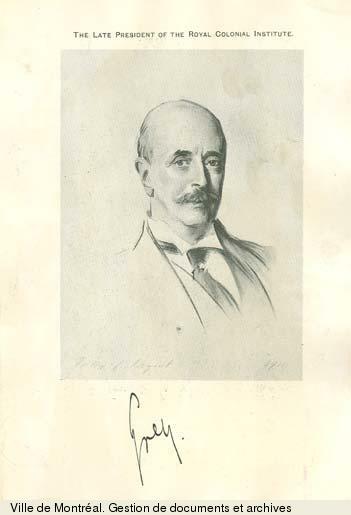 Disappointed with Laurier’s caution on the question, Grey entered into a secret scheme devised by Harry Judson Crowe*, a Canadian with lumber interests in Newfoundland, and backed by Robert Gillespie Reid*, who was a friend and banker of Sir Edward Patrick Morris*, a member of the anti-confederate government of Sir Robert Bond*. With Grey’s connivance, attempts were made to sideline Bond and force Morris to break with him and spearhead a move to confederation. When Bond refused to accept a peerage and leave for England, Grey tried to appeal to him through a mutual friend, British editor William Athelstane Meredith Goode, to the horror of the Colonial Office. The scheme failed and Grey escaped with relatively little damage to his reputation. A no less fervent champion of imperial values through cultural instruments, Grey promoted city beautification in Canada, national parks (his ideas for a national capital commission in Ottawa would be adopted much later), and recognition of historical sites and events. 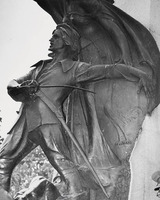 Regardless of the controversy generated by the tercentenary, Grey contributed in 1910 to the fund of the Association Catholique de la Jeunesse Canadienne-Française to erect a monument to Adam Dollard* Des Ormeaux in Montreal’s Parc Lafontaine. On social matters he visited prisons and called for prison reform, established a branch of the Public House Trust in the pioneer mining town of Cobalt, Ont., promoted the cooperative movement, and backed the Salvation Army’s plans for settling British delinquents in Canada. He also believed, as he explained to students at McGill University in Montreal, where he served as visitor, in using education to promote imperial ties. Undoubtedly these enthusiasms, along with his outgoing personality, contributed to Grey’s popularity and provided vice-regal reinforcement for debate elsewhere. 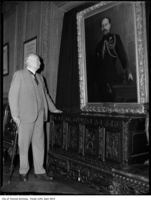 His humanitarianism, for instance, was shared by the deputy minister, then minister, of labour, William Lyon Mackenzie King*, a favourite guest of the Greys at Rideau Hall. 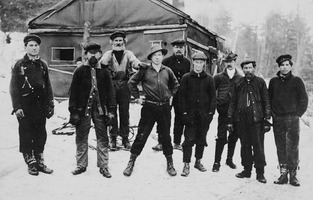 Grey’s interest in physical well-being emerged from this same concern for social reform and imperial wholesomeness, as well as from his lifelong attachment to sport and the outdoors. 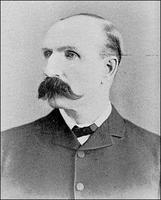 He promoted overseas clubs (hostels and meeting-rooms for overseas visitors), backed the Boy Scout and cadet movements, and persuaded Lord Strathcona [Smith] to amend the terms of his trust fund (set up in 1909 to promote physical and military training in Canadian public schools) to permit the remuneration of women cadet instructors. During Grey’s term in office, the ranks of scouts and cadets swelled, though a number of educators opposed military training in schools. Grey donated trophies to the Montreal Horse Show and for figure skating, but his best known contribution to the promotion of Canadian amateur sport is the Grey Cup. Donated in 1909 for the encouragement of football at the behest of Philip Dansken Ross*, editor and owner of the Ottawa Evening Journal, this challenge cup was first won, on 4 Dec. 1909, by the varsity team of the University of Toronto. 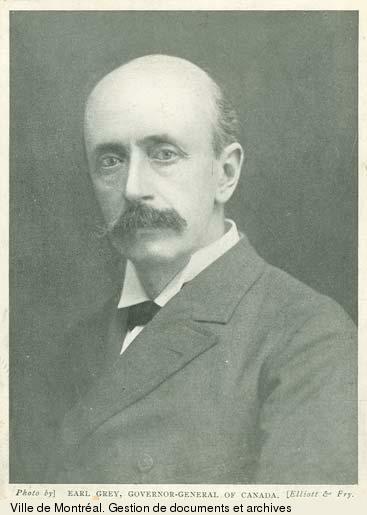 A more passionate interest of Grey’s was the performing arts: in 1907 he inaugurated a dominion drama and music festival and provided a trophy in each field. He was drawn too to Canadian novels, especially those of Lucy Maud Montgomery*, and to Canadian sculpture, often in the form of grand public monuments. Lady Grey similarly patronized a number of good works: she was president of the Aberdeen Association for the distribution of literature and of the Women’s Welcome Hostel in Toronto, and was honorary president of the Ottawa Maternity Hospital, the Victorian Order of Nurses, the Lady Grey sanatoriums of Toronto and Ottawa, and the women’s branch of the Numismatic and Antiquarian Society of Montreal. Like his predecessors, Grey travelled extensively, from the Maritimes to the Yukon, and attended a wide range of vice-regal functions. 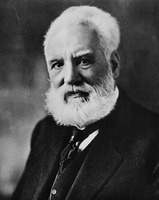 During his trip west in October 1909, for example, he laid the cornerstones of the legislatures of the new provinces of Alberta and Saskatchewan; in December he was at Baddeck, N.S., examining the laboratories of Alexander Graham Bell* and the aircraft of John Alexander Douglas McCurdy* and Frederick Walker Baldwin*. 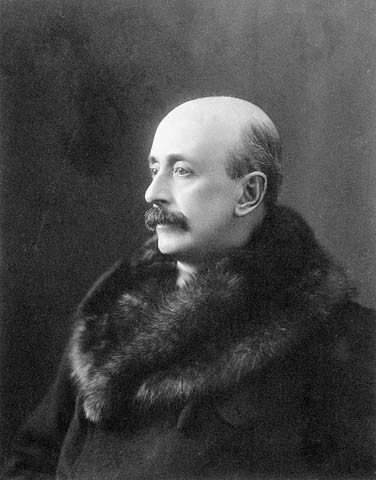 Although Grey, tired of imperial crusading and attacks from the nationalist press in Quebec, was anxious to leave Canada at the end of his term in September 1910, he was pressed to remain for another year, initially to accommodate his successor, the Duke of Connaught, and then to meet Laurier’s desire to have vice-regal continuity through a federal election. The year cannot have been easy for Grey. During the much-publicized by-election in Drummond and Arthabaska in Quebec in November, he was assailed for trying to influence Laurier in an imperial direction on the naval issue. In the months before the reciprocity election of September 1911, his enthusiasms, and tendency to indiscretion, seemed to revive. 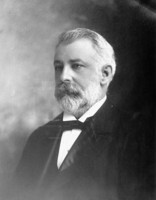 The victorious Conservative leader, Robert Laird Borden*, later recalled Grey’s conviction that Laurier would “sweep the country” and the governor general’s extraordinary attempt to convert a “prominent Liberal” opposed to reciprocity. Upon his return to Britain in October 1911, Grey continued to support social and educational causes. 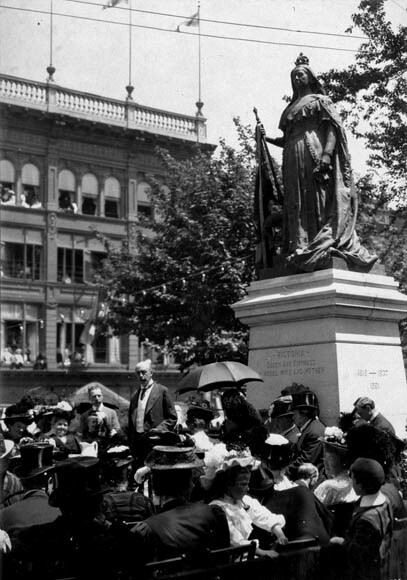 In 1912 he visited South Africa to unveil a monument and pay tribute to Cecil Rhodes. He served as president of the Royal Colonial Institute and promoted, without success, a scheme to set up a centre in London for the dominions. 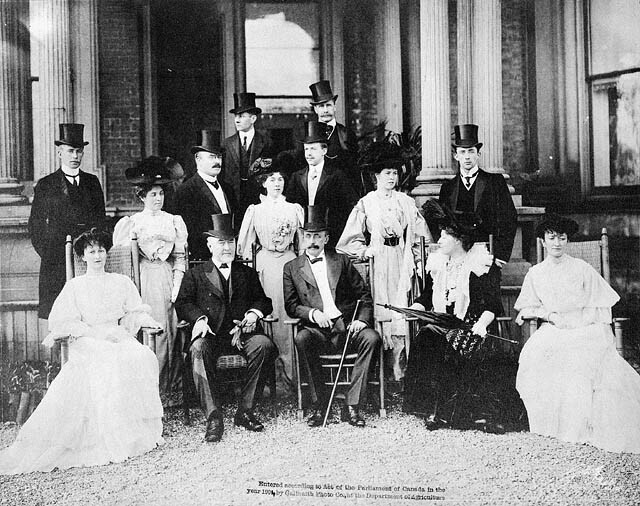 Grey died at his estate in 1917 and was survived by his wife, son, and two daughters. Addresses to His Excellency Earl Grey, g.c.m.g., etc., governor general of Canada, and his speeches in reply, having relation to the resources and progress of the dominion (Ottawa, 1908). Harold Begbie, Albert, fourth Earl Grey; a last word (London, 1917). Canadian annual rev. 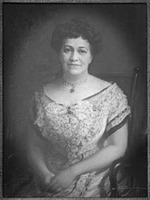 (Hopkins), 1904–11. Canadian men and women of the time (Morgan; 1912). R. MacG. 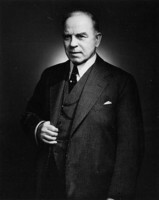 Dawson and H. B. Neatby, William Lyon Mackenzie King: a political biography (3v., Toronto, 1956–76). DNB. 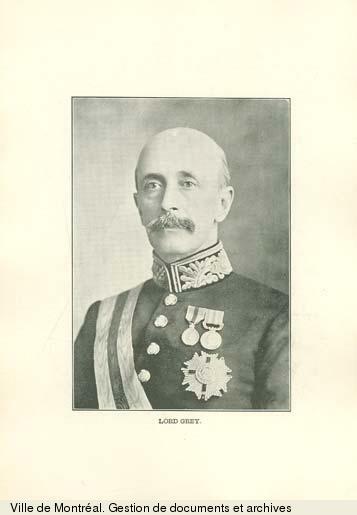 M. E. Hallett, “The 4th Earl Grey as governor-general of Canada, 1904–1911” (phd thesis, Univ. of London, 1970). F. A. McGregor, The fall & rise of Mackenzie King: 1911–1919 (Toronto, 1962). Peter Neary, “Grey, Bryce, and the settlement of Canadian-American differences, 1905–1911,” CHR, 49 (1968): 357–80. 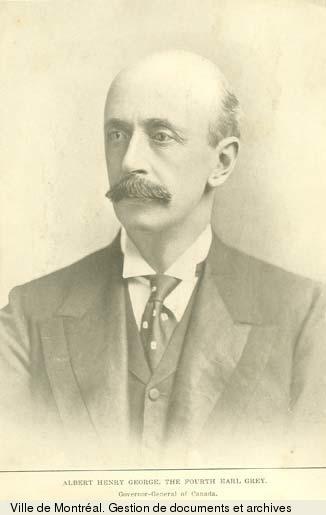 P. E. Roy, A white man’s province: British Columbia politicians and Chinese and Japanese immigrants, 1858–1914 (Vancouver, 1989). Carman Miller, “GREY, ALBERT HENRY GEORGE, 4th Earl GREY,” in Dictionary of Canadian Biography, vol. 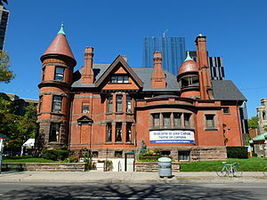 14, University of Toronto/Université Laval, 2003–, accessed April 24, 2019, http://www.biographi.ca/en/bio/grey_albert_henry_george_14E.html.